Crowns-Bridges-Dentures: Artfully and skillfully designed, fitted and placed by your North York dentist based on your own personal needs. Crowns are ideally suited for teeth that have large chips, cracks, substantial fillings, undergone root canal therapy, or are susceptible to fracturing. A crown acts as a shield, covering the entire surface of the tooth, helping to restore it to its natural shape, feel, and function. 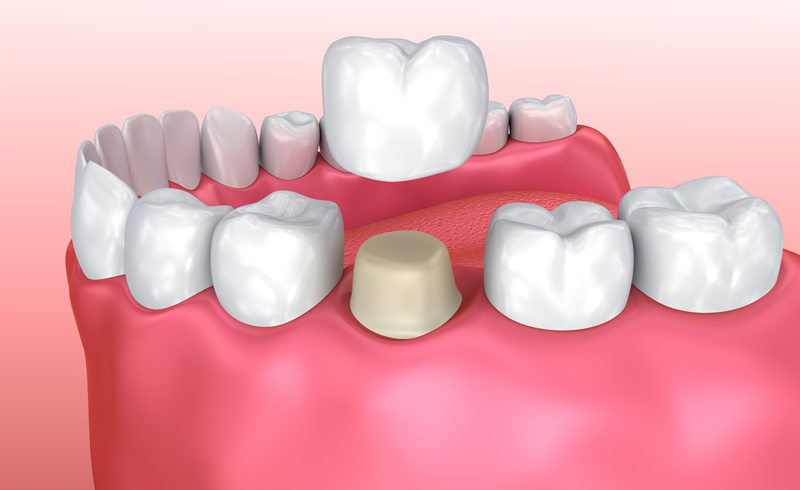 Once the crown is cemented into place, it will help prevent further deterioration and tooth loss. Placing a crown usually requires a minimum of two visits, the first to prepare the tooth and the second to cement the crown. The second visit usually occurs one to two weeks following the initial visit.Between appointments, you will be fitted with a temporary crown while our lab prepares the final crown. In some instances, we will ask our lab technicians to visit you in-office or at a nearby location to match the porcelain to the neighbouring teeth in order to create a perfect color match. A bridge is considered a beneficial option for those wanting to replace a partial denture or fill in gaps from extracted teeth. What is a bridge, exactly? 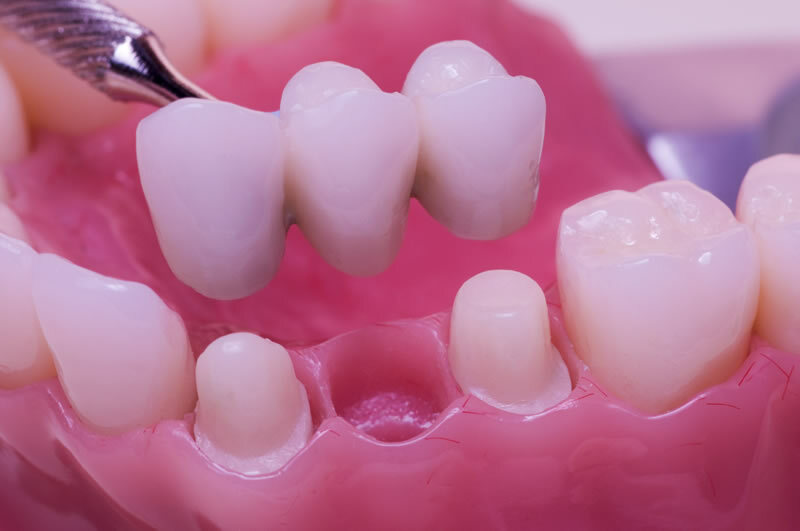 A bridge uses several crowns that are adhered together and a false (prosthetic) tooth is placed in each space where there was once a missing tooth. Since these are cemented in place, bridges are not removable and eliminate the need for partial dentures. This procedure can typically be completed in two to three visits. During your first visit, impressions of the mouth will be taken in order to create an accurate mould. Finding the right colour and fit of the bridge will usually take another one to two appointments to ensure it is functionally and cosmetically perfect. When required, we will ask our lab technician to visit you in our office so they can match the porcelain to the neighbouring teeth in order to ensure a uniform, natural look. Between appointments, a temporary crown will be set while the permanent crown is being created in our lab. Whether “full” or “partial,” the type of denture you select is largely based on your personal need and what works best for you. 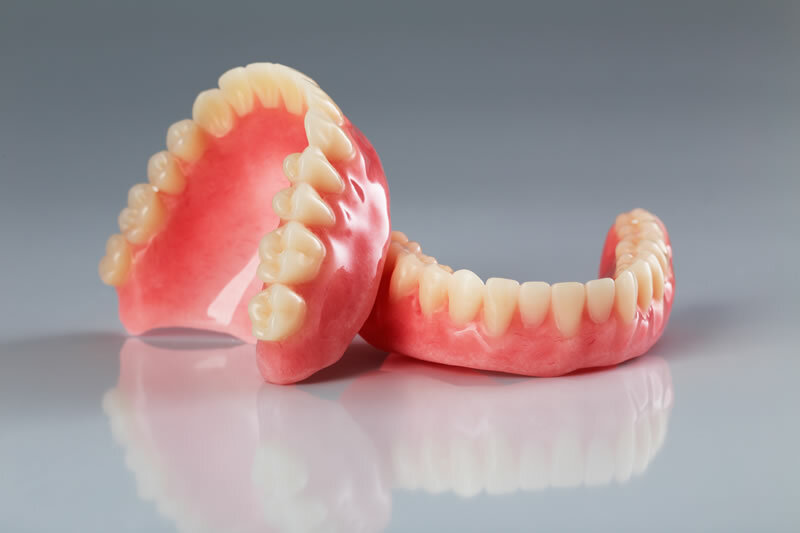 A partial denture is also referred to as a “removable partial denture,” since the prosthetic teeth are held in place by clasps that attach themselves to the adjoining teeth. Partial dentures are usually chosen when adjoining teeth are not strong enough to support a dental bridge. Partial dentures can be easily removed each night for cleaning and other activities. Also known as a “complete denture” or “false teeth,” full dentures are often used when all natural teeth are missing or have been extracted. Full dentures require as much care as natural teeth, including careful cleaning and the removal of plaque buildup. Remove plaque from teeth and dentures with a toothbrush. When cleaning, make sure the sink is full of water in case the dentures are dropped. Water creates a softer landing surface. Dentures should be soaked overnight in a specialized cleaning solution. Visit your dentist regularly to ensure your remaining teeth, gums, and supporting ridges remain healthy.